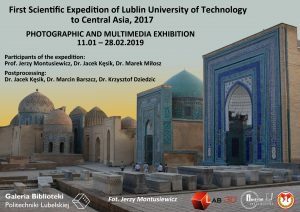 The present photographic and multimedia exhibition ”First Scientific Expedition of Lublin University of Technology to Central Asia, 2017” is devoted to the effects of the activities of a team of employees of the Institute of Computer Science who at the turn of May and June 2017 took part in the first (exploratory) scientific and research expedition of the Institute of Computer Science of the Lublin University of Technology to Uzbekistan. The organisers of this undertaking were dr hab. inż. Jerzy Montusiewicz, prof. PL and dr inż. Marek Miłosz. The team also included the following members: dr Jacek Kęsik, dr Marcin Barszcz and dr Krzysztof Dziedzic. The history of cooperation between the Institute of Computer Science at the Lublin University of Technology and the Science-Practical Museum-Laboratory of the Samarkand State University (SamSU), represented by its director Rahim Kayumov, dates back to 2014. In 2015, an agreement on cooperation between the universities was signed by the Rectors of both institutions. In the years 2015-2017, joint scientific and research work was carried out, using remote cooperation. It resulted in the publication of 5 articles in Spain, Kazakhstan and Poland. In May 2017, two people from SamSU were hosted at the Lublin University of Technology. All these activities enabled us to prepare well for the trip, i.e. the First Scientific Expedition of the Institute of Computer Science to Central Asia. We knew what our partner’s expectations were and we had logistic support. Leaving for Uzbekistan, we took with us two manual 3D scanners working in structural light technology, which also allowed to register the texture of scanned objects, and specialised laptops with very large computing powers. The equipment came from the Laboratory of Intelligent Systems Programming and Computer 3D Technology (Lab 3D) of the Institute of Computer Science. We made scans of 55 objects in the SamSU museum and the famous Afrasiab archaeological museum (the total volume of acquired data exceeded 75 GB). In addition, we conducted scientific seminars at the SamSU University and searched for interesting architectural monuments in Samarkand, Szabhizas and in Tashkent that would be related to the legacy of the “Silk Road”, which could be digitised during subsequent trips. In 2018, the Institute of Computer Science organised another trip to Uzbekistan and Kazakhstan, but this is an other story. Selected effects of previous work using the 3D scanning process and computer processing of museum artefacts can be viewed at https://cs.pollub.pl/lab-3d/. The exhibition opening will be held in the Gallery of the Library of the Lublin University of Technology at 14:00 on Friday, November 11th, 2019.